Rose Quartz is a macrocrystalline variety of the mineral Quartz (SiO2). Quartz is the most abundant single mineral found on earth, making up about 12% of the earth’s crust, occurring in a wide variety of igneous, metamorphic and sedimentary rocks. Rose Quartz normally occurs as massive, meaning it forms as large chunks of rock whose individual crystals have poorly formed boundaries, as opposed to forming well-formed, individual crystals. However in 1959, beautiful transparent Rose Quartz crystals were found in Brazil and to this day Brazil is the only known source of such well formed specimens. Rose Quartz’s colour varies from pale pink to rosy red and from opaque to, in rare cases, translucent. It is generally believed that it lends its colour to traces of iron, titanium or manganese and some have even suggested gold, though recent research also indicates that much Rose Quartz contains microscopic inclusions of a fibrous mineral resembling dumorturite. Because this mineral resembles, but isn’t exactly, dumorturite, it suggests that it is a new and as yet unknown mineral, a mystery of the mineral world. phenomenon known as asterism, the appearance of a star of light in the stone, similar to that found in star ruby and star sapphire. Such specimens are known as, of course, Star Rose Quartz. Rose Quartz is used as both an ornamental stone and a gemstone. In its ornamental applications it is not uncommon to find large, glistening, pink boulders of Rose Quartz in someone’s garden. Obelisks, pyramids, statues and spheres of Rose Quartz are common as tabletop and mantelpiece ornaments or are strategically positioned by those who believe in their metaphysical properties. Higher quality stone is carved into cabouchons for jewellery and in the case of higher quality transparent stones, Rose Quartz is beautiful when faceted. Rose Quartz is the stone of gentle love, said to open the heart centre and help one attune to the energy of love; both love of self and of others. For the broken-hearted or those experiencing emotional crisis, Rose Quartz is like a warm, soothing, caring hug, helping with the release of emotional stress, bringing a sense of wellbeing and calm and restoring self-esteem and confidence. It also softens the hardest of hearts, addressing one’s aggression and resentment and promoting compassion, patience and forgiveness. 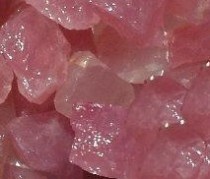 Rose Quartz is also the stone of artists and beauty. It renews the way we view the world, deepening our appreciation for nature, art, music and writing. Wear it to stimulate the imagination and enhance artistic expression. and even to assist with weight loss. When used as an elixir it is said to clear and soften the skin and prevent wrinkles. Rose Quartz relates to the astrological signs of Taurus and Libra.